Cupcakes! 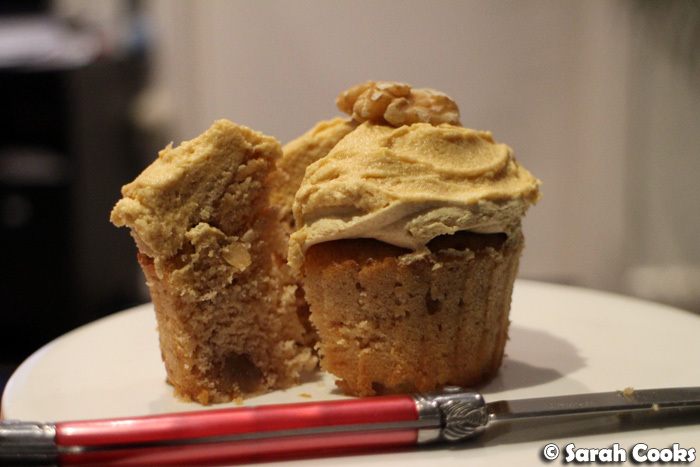 As I sit down to write this post, I realise it's been over a year since I baked cupcakes. (Remember my Black Forest Cupcakes?). I guess I don't really go in for cupcake baking these days, but a Canadian co-worker gifted me a packet of maple flakes (flocons d'érable in French), and I thought that cupcakes would be the perfect way to use them. But, back to cupcakes. 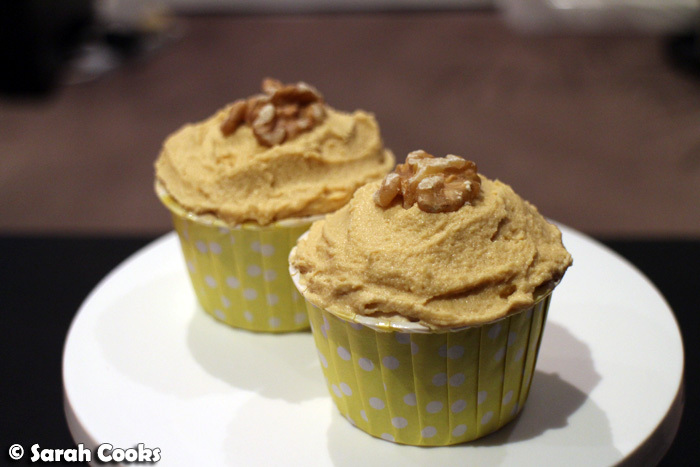 I googled a recipe for maple walnut cupcakes, and stumbled across these beauties by Martha Stewart. I subbed half the sugar in the recipe for maple flakes, reduced the overall sugar content and used salted butter to cut through the sweetness. (American recipes tend to be too sweet for me). You do need a sugar thermometer to make this, and we got ours pretty cheaply online. It really should go without saying, but boiling sugar is HOT! Be careful, wear shoes and long sleeves, and don't get distracted while you make it! It is a bit of a pain whisking in the butter - it takes ages, and you have to just stand there, listening to the noisy whirring of the mixer, adding one piece of butter at a time, waiting for each piece to be incorporated fully before adding the next. It's totally worth it though: check out the result! Love it! This type of buttercream is so smooth and creamy, with none of that unpleasant graininess that you get from a standard buttercream (i.e. icing sugar and butter). It's so, so mapley! I think it would be gorgeous with some espresso added and used as the icing for a traditional English coffee and walnut cake. And here are the cupcakes! I had initially thought to sprinkle them with extra maple flakes, but the icing was really sweet, and I didn't want to push it over the edge. A plain walnut was all the decoration I needed. I shared these with my coworkers and friends, and they seemed to go down really well. 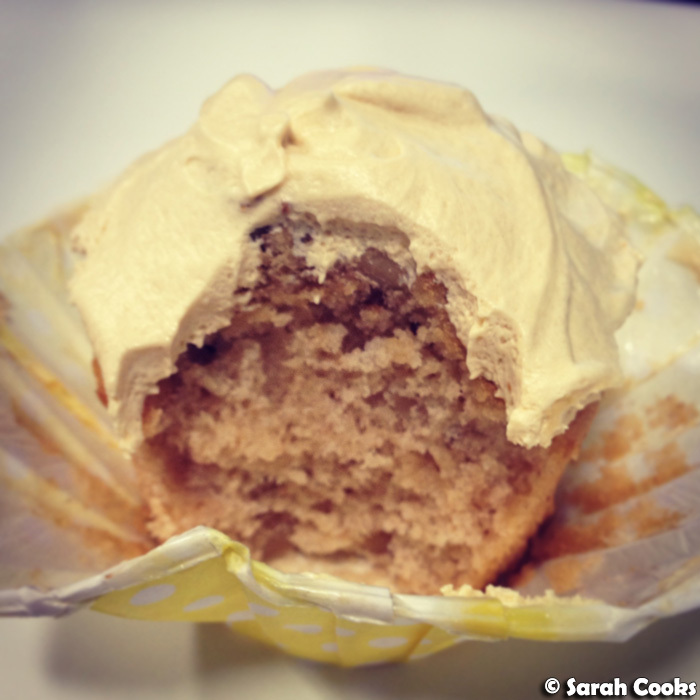 Actual quote from one of my coworkers: "That cupcake had the perfect texture". Yay! Despite my concerns about the sweetness, they were well balanced: the base felt more muffiny than cupcakey (yes, those are both words, I've decided), and provided a nice, relatively plain, base for the sweet mapley buttercream. Preheat the oven to 175C. Line two 12-cup muffin pans with muffin papers. Chop the walnuts into medium pieces. Toast in a dry frying pan until they smell lovely and aromatic. Tip into a bowl and set aside to cool. Sift the flour, baking powder, salt and cinnamon into a large mixing bowl. Set aside. 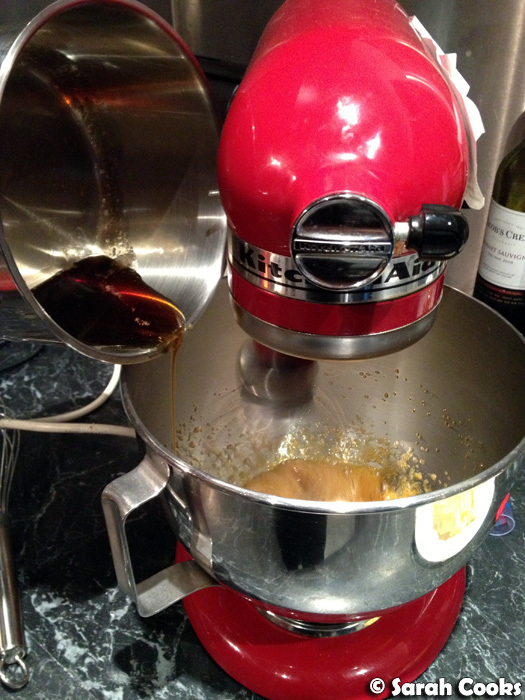 Beat the butter and sugar with an electric mixer until creamy and pale. Add the eggs, one at a time, beating in between each one. Add the vanilla extract and beat to combine. Now switch to a wooden spoon. Add the dry ingredients in two batches, alternating with the milk. Stir in the walnuts. 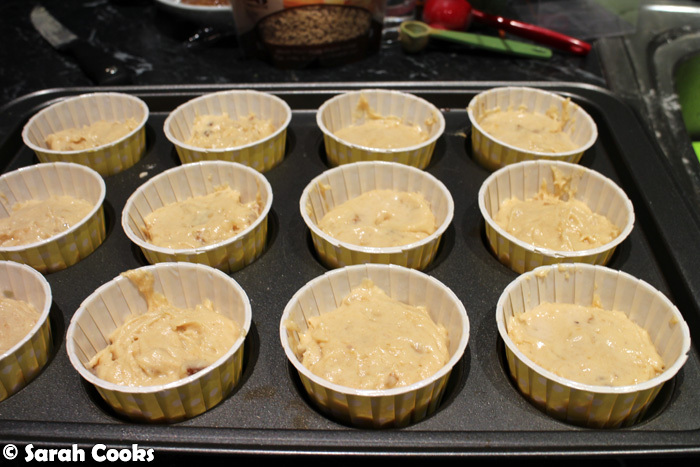 Divide the batter into between the muffin cups, filling to about three quarters full. Bake for 18-20 minutes, until lightly golden brown and cooked through when tested with a skewer. Allow to cool completely before icing. 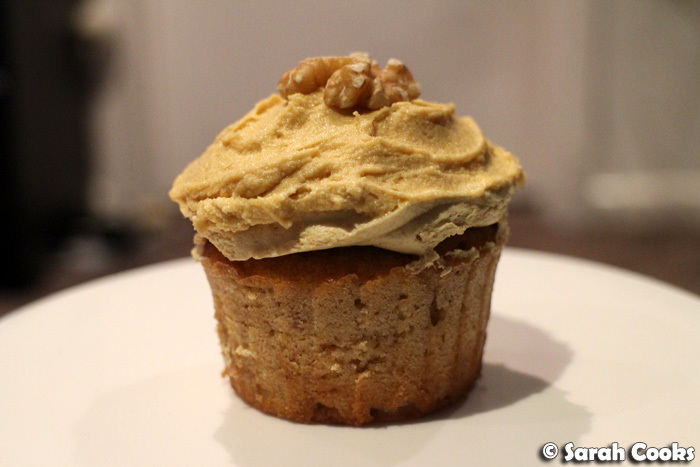 Decorate each cupcake with a generous swirl of buttercream and a walnut. 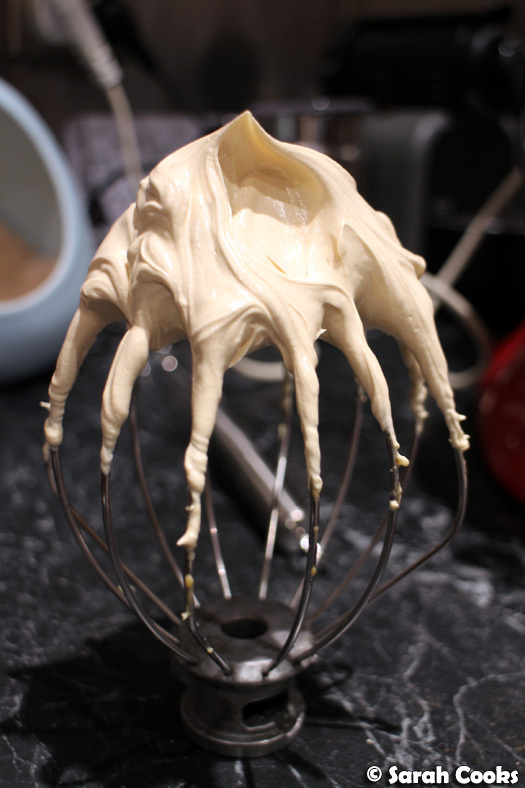 In the bowl of an electric mixer fitted with the whisk attachment, beat the egg yolks until pale and fluffy, about five minutes. 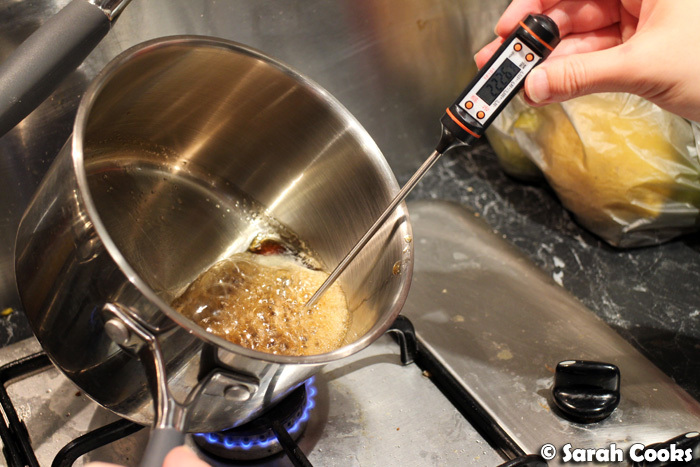 Heat the maple syrup in a small saucepan over a medium high heat. Allow to boil and continue cooking until it reaches 115C. Take off the heat. With the mixer running, gently pour the syrup down the side of the bowl in a slow, steady stream until it is completely incorporated. Continue whisking until the mixture cools down to room temperature. 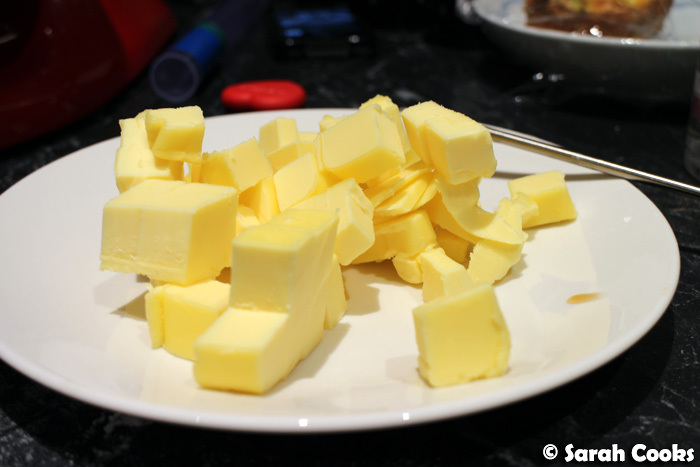 Add the butter, one piece at a time, only adding the next piece when the previous one has been fully incorporated. After about 5-7 minutes you will have a bowl of the fluffiest, smoothest, most delicious maple-y icing ever! (If it starts to look curdled, just keep whisking!) Whisk in the salt. 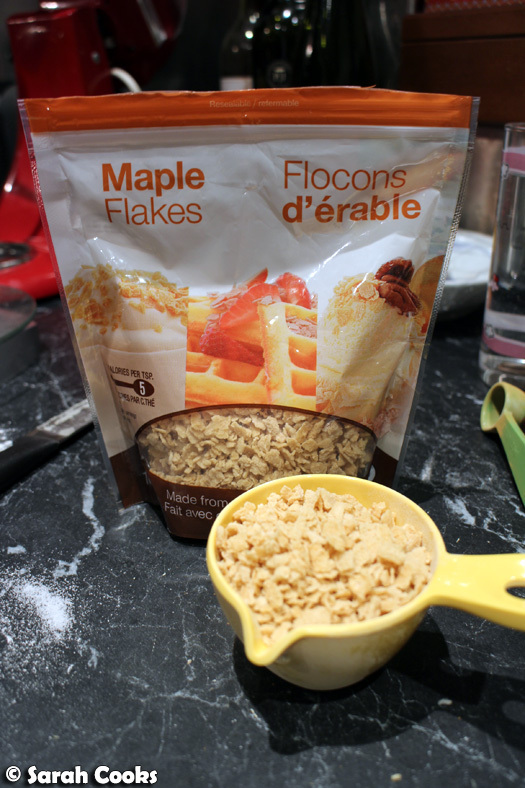 These look great Sarah - wonder where I can get my hands on some maple flakes! Mmmm, maple flakes! I was actually just eyeing the "100% Genuine Canadian maple syrup!!!" in the supermarket today, and I think you've put me in the mood for it! Oh my god, I made waffles with maple flakes just this morning!! Nah. I don't even own a waffle maker. But you absolutely must make peanut butter maple flake waffles. Eee this looks so technical! Ahahaha.. love it though, so cute..
Ahh it’s an addiction for sure! OMG maple flakes?!?! Can you please ask you colleague where I can buy some where? I want to make and eat these so badly!